Working in both graphite pencil and oils, observation is crucial to Clive’s working practice. Each of his drawings reveals meticulous attention to detail, achievable only by hours spent in the field observing animals in their natural habitat. About the artist: Based on the south coast of England, Clive Meredith is an entirely self-taught artist and has been working professionally since 1993, specialising in detailed portrayals of wildlife from both Britain and abroad. Clive’s initial interest in wildlife and the countryside was fostered in his early years, brought up the son of a dairy farmer, and spending hours outside in the Shropshire countryside birdwatching and larking about on the river Severn and its streams in his hometown of Shrewsbury. His art has been extensively published with over 70 limited edition releases to date and can be found in galleries throughout the UK and abroad, including in his brand new studio in his hometown of Warsash in Hampshire. Working in both graphite pencil and oils, observation is vital to Clive’s practice. Each drawing or painting reveals meticulous attention to detail, achievable only by hours spent in the field observing and photographing subjects in their natural habitat. 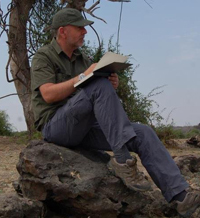 Aside from wildlife watching and photography in the UK, Clive has travelled extensively in Asia and Africa in search of subjects for his drawings and paintings. As a result, he has become renowned for the stunning realism of his images and an incredibly assured ability to inject real life and character into his works. In 2010, Clive was named Wildlife Artist of the Year by Wildscape magazine, after winning the prestigious annual competition with his image ‘The Egret Pool’. He also appeared as a finalist in the DSWF Wildlife Artist of the Year 2010, 2012 and 2013, with artworks exhibited at The Mall Galleries in London.